Solutions are how customizers and developers author, package, and maintain units of software that extend Dynamics 365 for Customer Engagement apps. Customizers and developers distribute solutions so that organizations can use Dynamics 365 for Customer Engagement apps to install and uninstall the business functionality defined by the solution. Use solutions to extend the capability of Dynamics 365 for Customer Engagement apps. For software that operates outside the application, use traditional methods to package and install your application, such as an installer program. If your application consists only of Dynamics 365 for Customer Engagement apps solution components, it can be imported directly into Customer Engagement apps. You won’t have to create an installer program. However, if your extensions include a combination of Dynamics 365 for Customer Engagement apps solution components and external components, which are not Dynamics 365 for Customer Engagement apps solution components, you’ll need an installer. For example, you can create a .NET Framework application that manages data stored in custom Dynamics 365 for Customer Engagement apps entities using the web service APIs. People who install your application may install a Dynamics 365 for Customer Engagement apps solution to create the custom entities and then install your application separately by using an installer. Or, you could include the installation of the Dynamics 365 for Customer Engagement apps solution into the installer you create for your application. Solutions exported from an earlier version of Customer Engagement apps can be imported into later versions as shown in the following chart. Generally, solutions can be imported into organizations less than two versions higher than the version the solution was exported from. Service pack releases will provide the option to either export a solution with compatibility for that service pack, or just with capabilities included in the base version. More information: Maintain managed solutions: Version compatibility. Solution components are created by using the customization tools or APIs included in Dynamics 365 for Customer Engagement apps and are fully hosted in the application. 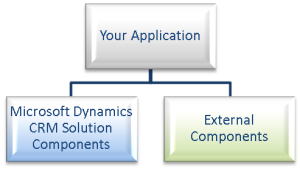 The following diagram shows the types of solution components. When you define a Customer Engagement apps solution you create a group of solution components that can be managed together. There are two types of Dynamics 365 for Customer Engagement apps solutions: managed and unmanaged. 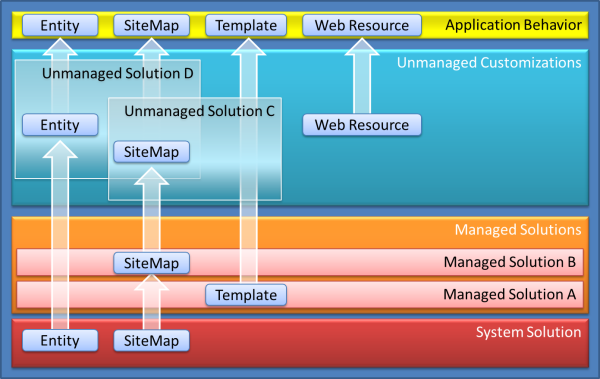 A managed solution is a completed solution that is intended to be distributed and installed. An unmanaged solution is one that is still under development or isn’t intended to be distributed. When the unmanaged solution is complete and you want to distribute it, export it and package it as a managed solution. The system solution represents the solution components defined within Dynamics 365 for Customer Engagement apps. 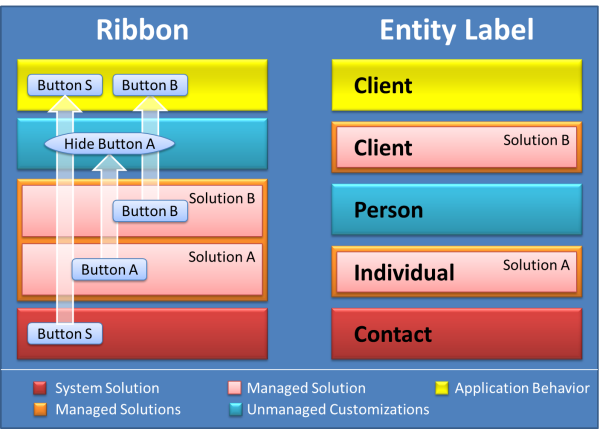 Without any managed solutions or customizations, the system solution defines the default application behavior. The ultimate behavior of an instance of Dynamics 365 for Customer Engagement apps for a specific organization is the culmination of the system solution, any managed solutions, and any unmanaged customizations. Each Dynamics 365 for Customer Engagement apps organization contains customizable solution components. Together, all of these solution components are called the default solution. This is the solution you edit when you select Customize the System in the application. You can export this solution and the customizations in it in just like an unmanaged solution. However, you can’t export the default solution as a managed solution. If you don’t intend to generate a managed solution, you don’t have to create an unmanaged solution. You can customize the system directly. Organizations that just want to be able to edit, back up, and transport their customizations don’t have to use the more advanced capabilities of the Dynamics 365 for Customer Engagement apps solution framework. After you generate a managed solution, you can’t install it in the same Dynamics 365 for Customer Engagement apps organization that contains the unmanaged solution used to create it. It must be installed in a different organization. When two or more solutions define solution components differently, Dynamics 365 for Customer Engagement apps resolve the conflict using two strategies, Merge and Top Wins. The following diagram illustrates the differences. Dynamics 365 for Customer Engagement apps natively supports multiple languages. 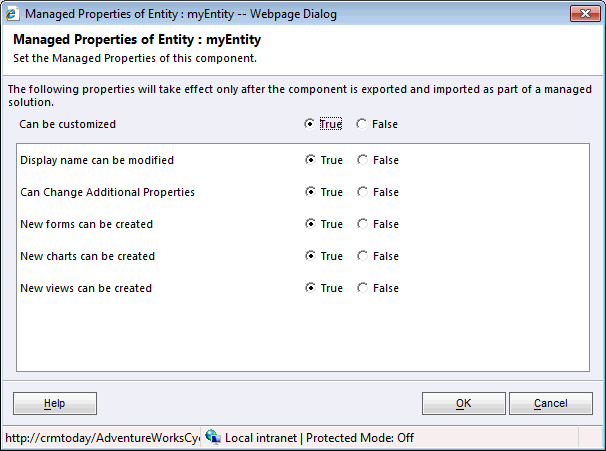 Whenever a language pack (sometimes referred to as a ”MUI pack”) is installed, user interface elements can be displayed in a different language.